Welcome to the Finnish Hamster Association’s website! Finnish Hamster Association was founded in 1989 and it operates in the whole country. The association maintains relations to hamster clubs, breeders and show judges abroad. We are a member association of the Finnish Rabbit and Rodent Breeders’ Federation. The Finnish Hamster Association’s main language is finnish, but we are happy to communicate also in english and swedish. The Finnish Hamster Association’s goal is to promote knowledge about pet hamsters, support the breeding and showing of hamsters and bring hamster breeders and hobbyists together. 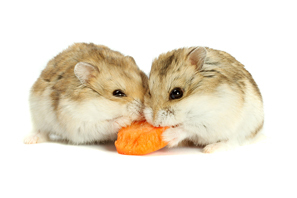 The association organizes hamsters shows, breeding courses and other hamster-related events and takes part in pet trade fairs. Our association welcomes all hamster lovers from Finland and abroad. Members receive the finnish-language hamster care booklet ”Hoitopussi” and finnish-language club magazine ”Poskipussi” four times a year and get discounts from show entry fees and other events. List of Finnish Hamster Association’s registered hamster breeders can be found here. Do you want to attend a show? You can find the hamster show calendar here. Want to join the Finnish Hamster Association?